First time on the market! Outstanding quality farming country with magnificent views to the north from multiple home sites. 2 pristine rural properties totalling 285 acres (115.6 ha) and 220 acres (89.12 ha) side by side are now available for the astute farmer. 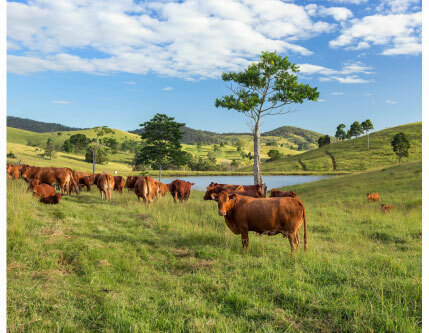 Located in the tightly held farming district of Woolooga, 30 minutes north west of Gympie, both properties have double frontage to Bongmillerer creek with rich and fertile soils opening to undulating pastures with a magnificent mountain backdrop. Excellent internal access via newly constructed tracks wind through the property and all the way along the creek for ease of management and enjoyment of the versatile and pretty farming country. Perfectly private with beautiful valleys and open pastures, these are truly some of the best farming alotments in the district each capable of supporting up to 65 head of cattle. The country is also perfect for mixed farming and will grow anything. Lot 8 totalling 220 acres and Lot 9 totalling 285 acres. Unbelievable value, priced to sell and guaranteed to impress â€“ secure one or both of these top quality farming blocks!